There’s something therapeutic about moss. It’s nearly impossible to resist the urge to touch the soft, lush growth. It’s a tactile treasure, perfect for green thumbs and not-so-green thumbs. We were introduced to the beauty and ease of Moss Rocks! by natural gardening advocate Annie Haven. Moss Rocks! container gardens make it easy to enjoy in your home, office or backyard. Dicranum moss is planted in sculptural, stone-like containers that contrast with the tufted greenery. The effect is simple yet striking, with a Zen-like vibe. David Spain, an expert on moss, and his business partner, Ken Gergle, have been designing moss gardens for more than 10 years, and they’re committed to educating gardeners about how to sustainably propagate moss. Their Moss Rocks! planters are designed for moss aficionados and newbies. The pre-planted vessels have a patent-pending reservoir system that makes watering simple, and the ceramic containers are frost-resistant, so you can leave them outside without worrying about cracking. Each one is a work of art (and no wonder, since David is an artist).They’re great for gifting, though very hard to part with. 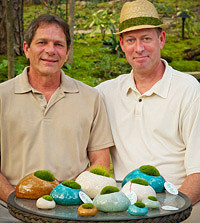 Hi Daily Grommet fans, I'm David, co-owner of Moss and Stone Gardens. I am passionate about moss gardening, cultivation and education. My partner and I developed the world's first pre-planted moss containers, that we call Moss Rocks!™, and we are delighted they have been chosen as The Daily Grommet! I am here to answer any questions you may have about Moss Rocks!™ or even just questions about moss. I love moss, and I really love that moss lawn you created. My compliments on the Moss Rocks. It strikes me as a very simple and masculine design good for a man's office. Is there dirt under the moss? Also, the moss looks taller than what I'm used to. Is it a special type of moss? @Judy G Hey Judy, the Moss Rocks! are made without any soil, this is one of the unique aspects to our product. The mosses used are acrocarpous (upright growing) which gives them a mounding quality. We think this adds to the overall design appeal. Thanks Moxie for the compliments, you're so right that Moss Rocks! appeal to men as much as they do to woman. WTG (Way to go) David Spain and Ken Gergle for bringing to market such a fantastic product, and for Bhulla just for being there! Love your product, love writing for you. I think moss is mossome because of what you have taught me! You make moss magical AND I can bring it indoors! Helen Yoest who gardens with confidence. @Helen Yoest with Gardening with Confidence Thanks Helen, we couldn't have done it without you! I love this...I have a question though. Do you get all 4 of the rocks when you purchase? @Vicki Glad you love it Vicki, each of the three sizes are ordered individually, they are not offered as a set. You can place all of the items into your cart one at a time and then proceed to checkout. Looking forward to ordering, these are beautiful! @Rebecah Glad you think so Rebecah! The Moss Rocks are wonderful. I see them as nature sculptures that you just have to touch. They are very zen-like and peaceful and could be enjoyed anywhere you want to find a bit of tranquility. @Kathy @nativegardener Thanks Kathy, the design was inspired by nature and the way these Dicranum mosses grow on top of stone naturally. I live in Co. Will the plants need to be brought in in the winter? And if the moss dies, do you provide more moss to begin again? Thank's. @Kevin G. Hey Kevin, the moss and the containers are suitable for outdoors during the winter. Yes, you can get new moss for the planters if something happens to them. @dirt under my nails Hello Dirt under my nails, have you contacted Moss and Stone Gardens for assistance with your problems? Since the Daily Grommet isn't the retailer you purchased from, it would be appropriate to not use their website for this issue. Please email Moss and Stone Gardens for assistance or contact the retailer from which you purchased it. Thank you. There are replacements available for your Moss Rocks! I'm simply mad about Moss Rocks they are the most unique gift you can give. I suggest when you purchase them you buy one, two or three for yourself because once they arrive you will not want to give them up! They are really that cool... Moss Rocks really do ROCK! @Annie Haven | Authentic Haven Brand Thanks Annie, you rock too! I have nine pebbles and they are gorgeous! I love them and have found a nice shady spot for them in the fairy garden. They were supposed to be gifts for my family, but, well I am still *testing* them out! @Faire Lol, thanks Faire, and let this be a warning to the rest of you! Is it ok for cats if they eat the moss? Have two in my home. @Kathy Hello Kathy, mosses are not poisonous and are not listed on any poison control lists. They are safe for pets, children and are hypoallergenic in case someone has allergies! We're loving the excitiment behind today's Grommet, Moss Rocks! This Grommet submission came at us from all angles on social media and we knew that they must be something special. We love that Grommet submissions can come from anywhere, anytime -- so feel free to let us know what products you love. You can submit them here through our Citizens' Gallery or even to us via Twitter, Facebook or Pinterest. I'm interested in information about the other products listed--moss stream and a rain shower? I love the idea of all kinds of shapes and textures of plants--have a number of air plants I'm nurturing now. Also, can you choose the color of the stone? @Tex Freeman Hey Tex, the Moss Rainshower is a 2 oz. ultrafine mister and the Moss Stream is a 250 ml. squeeze bottle with a fine gooseneck applicator. These are excellent for controlled watering and providing a highly atomized mist. The Moss Rocks come in four different colors and you can select whatever one you wish! I have been interested in moss gardens for many years and until Moss Rocks came along, I had no idea where to get it, care for it etc.. It makes a perfect gift for an office, or for someone who says they have a brown thumb. 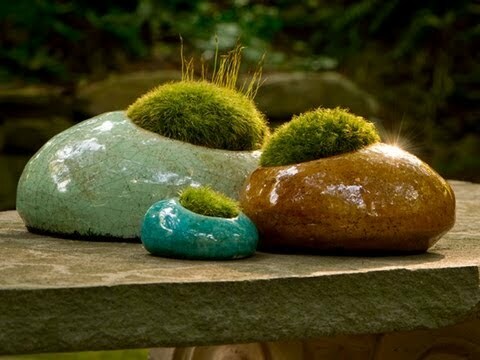 I just love the feel of moss and the containers Moss Rocks came up with for the moss is both unique and artistic! I have several moss rocks and love them. But one is turning brown and doesn't look as healthy I water them at the same time once a week. What am I doing wrong? @Patricia Hey Patricia, it is a little difficult to answer your question with so little information to go on. Take a look at the care instructions provided here on the Daily Grommet, it's below the video for Moss Rocks and you will click on the details tab. You can also contact customer service on the phone to get more detailed care information. Thank you for your question, sorry I couldn't get more specific here on the message board. @Nancy Heckler Join the club Nancy, we daydream about moss all day long at Moss and Stone Gardens! I love these little guys. I recently received a Moss Rock and have enjoyed it! @Shawna Coronado Nice to hear that Shawna! David, I'm telling friends I want some of these for my birthday. I have wanted to replace my lawn with moss for quite some time. Do you sell larger quantities of moss? A local greenhouse was not interested in helping me when I tried getting started with this a few years ago. @Kate Stiffler Hello Katie, I hope your birthday will be a good one! Moss and Stone Gardens does not offer mosses for landscaping through mail-order at this time. Our landscaping is only local. This is a great product. Being able to bring a little bit of "green" into an otherwise dreary office has made all the difference. 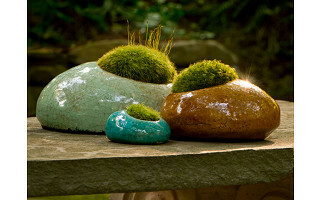 @Christopher VanCleave So glad to hear our Moss Rocks have spread the green to your daily surroundings! Moss Rocks! are just so very cute! I can think of several people right off the bat who need these...great gifts! These stones are a great way to bring the bryophytes indoors. Great idea for us moss maniacs! @Jared Barnes Just what us bryophytanicals needed! Thanks Jared! @Stella Z Thanks Stella, moss and toadstools are perfect for each other! I love your moss and just wondered if it is poisonous to cats and dogs? @Elaine Hurlbut Hey Elaine, moss is not toxic to eat but it does have a bitter taste which deters foraging. I was just wondering where I might find a Price-List? I don't seem to be able to locate one on the web site! @ Rose: On the far right of the video clip on the Moss Rock featured page , there's a Price Range. Under the Price Range is an OPTIONS box. Click the down arrow and you'll see the prices. When will the moss rocks be available for purchase again? These would make quite lovely Christmas gifts. Do you make the containers yourself? Or are you just planting them with moss? Can moss rocks be kept inside? @ Pam yes, they can be used inside. In fact, more people use them inside than outside. Thank you so much. There’s something therapeutic about moss. It’s nearly impossible to resist the urge to touch the soft, lush growth. It’s a tactile treasure, perfect for green thumbs and not-so-green thumbs. We were introduced to the beauty and ease of Moss Rocks! by natural gardening advocate Annie Haven. Moss Rocks! container gardens make it easy to enjoy in your home, office or backyard. Dicranum moss is planted in sculptural, stone-like containers that contrast with the tufted greenery. The effect is simple yet striking, with a Zen-like vibe.